If you’re not up to speed, the whole lovely affair started here. Go ahead and read it. I’ll wait. To recap: After my thirteen-year-old mini refrigerator gave its last gasp, I needed to get a new one. 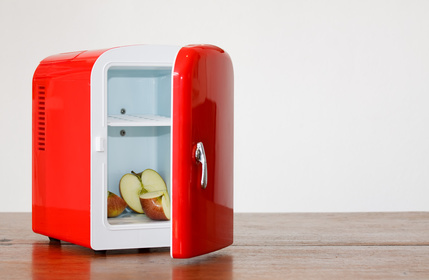 Turns out they don’t make mini refrigerators the way they used to. That’s what the not-so-mini refrigerator repairman told me when he came to examine the faulty seal on the Magic Chef unit I had purchased after returning the other two appliances that were not up to par. I recalled the tennis shoes I had purchased that had a six-month guarantee. My environmental hackles rose. “Uh…doesn’t that mean air is getting in?” The top corner still gapped. He ignored the question. Instead, he told me about the interesting customers he’d encountered. There was the guy who worked as a crane operator, who helped some NASA scientists with an experiment by dropping things from on high to see if the objects would remain intact. This was part of the design process for the rover. Unfortunately, everything shattered. One day, the crane operator leaped off his crane, landing with flexed knees, and said, “Ah ha! It needs knees!” And he became forever famous (at least in the world of NASA) for the brilliant idea of flexible legs on the rover. There was the guy who was shot in the head, the bullet lodged in such a precarious position that operating on it would have killed him. So the surgeon had the brilliant idea of putting the guy in NASA’s (again?) centrifuge, which whirled the poor fellow around at high speed, magically dislodging the bullet from the same hole it went in. “I love meeting interesting people,” the repairman said, and looked at me as if waiting to hear what brilliant idea I’d contributed to humankind. I thanked him for his time, and sent the jolly man packing. I wracked my brain for a brilliant idea on how to get the refrigerator back into its box, back into my car, and back into the store without sending my back into another spasm. The plan I came up with was this: buy yet another fridge, and store The Magic Chef in the garage temporarily, JUST IN CASE. As luck would have it, Dave had a buddy at work who had just purchased a mini refrigerator on Amazon. The guy had it delivered straight to the office, and he set it up next to his desk for bottled drinks. It hummed. It purred. It was so quiet, according to Dave, that you wouldn’t know it was on. I gave Dave my mini thermometer and instructed him to stick it in the fridge and monitor it. After a week, the verdict was in: the temp never budged above 35 degrees. Long story short, I rushed to Target to buy it. As it turned out, it was the EXACT SAME REFRIGERATOR I first purchased before all this madness began, the one that looked like it was made for Barbie-doll food. One of the shelves, I discovered, could be moved up or down to accommodate adult-sized food. I plugged it in. I set my thermometer on the top shelf. Then the bottom. Then the middle. Then the door. I nudged the temperature control a smidgen up and down and up and down until it was just right, and then I loaded my food onto the shelves. I am here to report: The refrigerator doesn’t purr. It has a faint high whine. Like tinnitus. Dave wouldn’t notice because he’s got tinnitus. If you’re following this blog—and isn’t it required reading somewhere?—you’re familiar with The Refrigerator Incident. Specifically, the mini refrigerator, the one that conked out on me that I had to replace, resulting in a few hours of back-breaking effort getting a new one in and out of my car, and out of its box, only to discover that the inside shelves would only accommodate enough food for three days if you’re two inches tall. So it was back to the store with the new fridge to trade in for something human-size. The only glitch? Getting it back into my car. But first, I had to get it back into the box. I scooted the refrigerator onto the bottom cube of cardboard, no problem. The rest of the box fitted over the top with ease. The problem was connecting the two sections. How the heck was I going to get this monstrosity into the back sear of my car in one piece? Do not attempt to move this by yourself. Get help. You could damage your back, or worse. I wondered about that. What’s worse than damaging my spine? A hernia? Could I lose some fingers? Take out a knee? I decided to ignore the warning and push the refrigerator top first into the back seat of my Corolla. And there it remained until I figured out how to get help. My landlady rents out a room in her house to a young man who works at Google and spends all his free time behind closed blinds, playing video games in his man-cave. For all I knew, he could have been an imaginary tenant, except that every weekday morning his BMW is gone from the driveway when, supposedly, he goes to his job, which involves sitting behind the wheel of a driverless car for eight hours. I decided to ask him for help when he returned home. Although I had doubts about his muscular abilities. Still, he was my best shot. So I waited. And waited. Occasionally, I went out to my car and tried pushing the refrigerator in by myself. Finally, I heard his car door. I dashed outside. I spied him in his J Crew outfit, trying to disappear through the front door. To make a long story less long, we got that sucker into my car. I drove back to Target from whence the refrigerator came, found an employee to offload it, and got my money back. I had maybe 18 hours to get my food out of my landlady’s refrigerator before she returned home from Reno with shopping bags full of groceries. I drove to Home Depot at a brisk pace. I had never been to Home Depot. I parked in the second row of cars near the front of the store, found the refrigerator display, looked inside the various models, decided on a Magic Chef—the only model they had—paid for it, and asked for help loading it into my car. The clerk sent me an elderly man. Off I went to pull my car up to the entrance. I walked down the second row of cars. I walked down the first row of cars. I walked down the third and fourth and back again, and up and down and back and forth, pointing my key fob in every direction while pushing the alarm button and all I heard was the elderly man yelling “Come on!” I retraced my steps from where I had pulled into the parking lot and still, no silver Toyota Corolla. Correction. Several silver Toyota Corollas, but none of them mine. I pulled out my cell phone, called Dave, and told him someone had stolen my car. And I couldn’t remember the license plate number. In the second row, right where I’d parked it. Sheepishly, I drove up to the elderly man who was now sitting on my refrigerator. “Thought you lost your car?” he said. “I’ll bet you know where your husband is.” He and his elderly buddy shoved the fridge into the back seat and went off chuckling. It took two men to get the thing into the car. Granted, they were old men, but still. Two. I heard some rustling. “Give me thirty minutes,” he said. An hour later, I called Dave. “If you happen to be out riding your bike today, can you swing by and help me?” Over six miles out of his way, but the guy likes his exercise, so I figured I was doing him a favor. And then my landlady returned home. I ran out to warn her. Something in my face, in my repetitive, “I’m so sorry my food is hogging your refrigerator” must have triggered sympathy in her. She brushed my apologies aside. “Don’t worry about it,” she said. I pointed to the humungous box in my car. She offered to help get it out. We shoved that refrigerator upright onto a make-shift dolly, and rolled it into my cottage. I waited for Dave to arrive to unpack it. The sun was setting when he finally rolled up, sweaty from the ride. He took off his helmet and muscled his way through the door. He pulled the strapping tapes off without snipping them—a wise move, in hindsight—took off the box and maneuvered the fridge into its cozy space. We stood back in admiration. “I like it,” he said. And then I noticed: the upper corner was smashed. The hinge didn’t sit properly. The seal wasn’t plumb. The stupid thing was damaged! I groaned. I may have cried a little. Dave put it back in the box, pulled the strapping tapes over the top, and carried the refrigerator out to my car. He shoved it in the back seat and peddled away on his bicycle, muttering loudly about people who don’t help. Google guy stepped outside. “Do you still need help?” he asked. I gave him a beady look. The next morning, my landlady offered to follow me to Home Depot in her SUV. I exchanged the damaged fridge for a new fridge. But first, I had the Home Depot guy take it out of its box so I could examine it. He loaded it into my landlady’s SUV. At home, we dollied it into my cottage. I set it up, and four hours later, turned it on. By evening, I loaded my food into it. I threw away my food. I’m now waiting for a service technician to pay a visit. I wonder if he’ll be as incompetent as the guy who came to demolish the pool with a shovel. My mini refrigerator died. It had survived thirteen years, which in refrigerator years is, like, fifty, but after this last heat wave, or my five-millionth defrosting job, it went to the happy junk yard in the sky. I always time my defrosting duties for when my landlady is out of town, so I can store all my perishables in her full-bodied refrigerator. She was in Reno until Saturday. My mini fridge died on Friday. I had to get a new mini fridge pronto before my landlady came home with a Costco-sized load of groceries. That left me twenty-four hours to get my food out of her refrigerator. So on a day I normally work my second job because my first job doesn’t pay all the bills, I went hunting for a new refrigerator that wasn’t in the budget. I scoured the internet for brands, and read reviews. Armed with a list of possible candidates, I got in my car. First, I headed to Costco. I walked the entire store and found zero mini fridges. I also found zero food demonstrators, so I had zero sustenance for my epic journey through Costco. Next up: Walmart. I loathe Walmart only slightly less than I loathe IKEA, mainly because the people who work in Walmart seem profoundly unhappy, and none of them speak my native language, the Queen’s English. I traipsed hither and yon looking for mini refrigerators, and finally spied the empty shelves where once they stood. I looked around for a helper. “Si. Here.” He directed me to the empty shelves and we stood side by side gazing at them. “Are there any in back-stock?” I wondered aloud. I drove across the street to Target. I spotted a young woman wearing the Target colors: a red top and khaki pants, and asked where I might find the mini fridges. “The kitchen section, if we’ve got any,” she said. I walked five miles looking for refrigerators that didn’t exist. First, to the kitchen section, where I found shelf labels, but no actual mini fridges. I hunted for a helper. There are no helpers in Target. There are shoppers wearing red tops and khaki pants who have no idea what’s in back-stock, but no Target employees walking purposefully, or even sauntering, down the aisles. I know this, because I walked up and down every aisle until I was at the front of the store again, asking one of the cashiers for help in the kitchen section. She pointed me to a guy with a walkie-talkie who promised to help, and then promptly disappeared. I asked another cashier who pointed me to guest services, where walkie-talkie-guy was chit-chatting with an employee. “I’m on it,” he said when he noticed me, and promptly disappeared. I asked another…I’ll cut to the chase. Somebody finally found a mini refrigerator, I paid for it, and a beefy fellow wrestled it into the back seat of my Corolla. Dare I tell you what happened next? Remember, I was under deadline. My landlady was packing to come home. She would undoubtedly stock up on food before arriving. I had less than 24 hours to get my new fridge into my cottage, out of the box, allow four hours for it to stand upright before plugging it in because that’s what the directions say, clean it, turn it on, and get it to the proper safe food temperature which takes, oh, twelve hours. I decided to get that refrigerator out of the car by myself. Granted, this was a mini version, and half my height, but it was twice my weight, or what felt like twice my weight after pushing and pulling and shoving and angling and using forceps to get the dang thing out without breaking my car door. This, I imagined, is what it feels like to give birth. Without the mess. I dragged it over uneven pavement to my back door, heaved it over the doorstep, and rocked it down the hall. I clipped the packing straps in two, and started cutting the sides of the box with an Exacto knife before realizing I could lift the box off its base, wrangle the fridge off the styrofoam, and push it into position. I hunkered down and opened the small door. The photo on the outside of the box showed a variety of food filling the shelves, one item being a jar of Mayonnaise. I should have realized…the jar was Barbie-doll size. Upon closer inspection of said photo, the Mayonnaise jar was no bigger than the Yoplait yogurt crammed next to it. This refrigerator had midget shelves. Obviously, this mini fridge was designed for someone who lived in a man-cave subsisting on frozen dinners and a single stalk of celery. I need a crisper that’s bigger than a wallet. I needed to get that refrigerator back in its box, down the hallway, over the uneven pavement, into my car, and returned to Target in exchange for another refrigerator at some other store which, hopefully, had something in stock.